Every stoner or medical marijuana consumer out there knows there’s nothing better than a perfectly brewed cup of coffee first thing in the morning to go with your wake and bake toke session.What if there existed a world in which you could combine the two, and have a wonderful cop of coffee that also got you stoned? Even better what if it was a vegan cannabis infused coffee? Well we are here to give you a marijuana coffee infusion recipe that Starbucks could only dream of having. The most ideal cup of coffee is one that is crafted to absolute perfection, a pursuit that takes both determination and precision. While you can go all out barista by taking the time to measure your water on a scale and use a stopwatch to clock your brew times, we are going to do this a little easier. So for this recipe, you’ll want to cold press the coffee you’ll be using. Cold Pressing coffee decreases the acidity levels of your coffee by 3/4 and contains less caffeine than a normal cup. Upon consumption, cold pressed coffee will give your digestive system a break, and help keep your PH levels in balance. Making a weed coffee drink with the cold press will give the cannabis infused coffee a very strong coffee flavor, as it concentrates the flavor elements of the coffee. This will help to mask the plant flavor from the marijuana, and provide a smooth, sweet flavor that you’ll enjoy. We use a Hawaiian Kona light roast vanilla macadamia nut coffee, and it's cold brew concentrate counterpart. Kona coffee only comes from Hawaii and is one of the best tasting coffees in the world. You can use whatever coffee you like, however the end result with our full recipe is a warm, nutty, sweet, organic coffee, with subtle hints of vanilla and cannabis. The aftertaste will leave a distinct light vanilla coffee flavor. This is a cannabis infused coffee drink you owe it to yourself to try if you consider yourself any type of coffee drinker.Any kind of stoner will enjoy this as well. 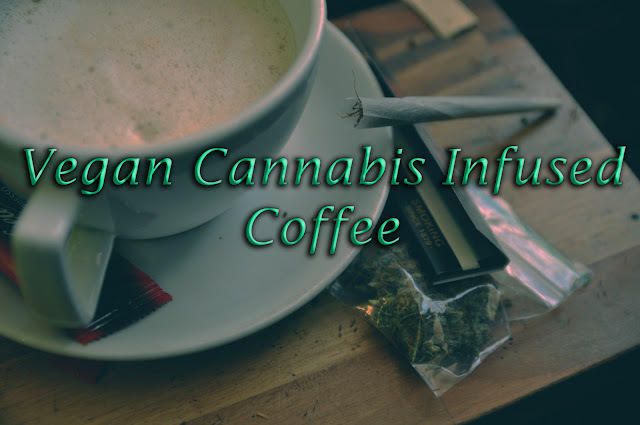 This cannabis infused coffee recipe is vegan, gluten, and dairy free. This cannabis infused coffee recipe uses The 420 Shacks recipe for Vegan Coconut CannaOil. You can adjust the CannaOil recipe to the desired amount of THC, and then adjust this coffee drink recipe accordingly for dosage. Following our exact recipes will get you about 3-4 cups of coffee with each cup containing 10-15mg. If you are looking for something special to drink your cannabis infused coffee out of, then check out this mug that you can smoke out of while you drink! In your french press mix 3 cups room temperature water and 1 1/3 cup coarsely ground coffee of your choice. Let the coffee mixture sit in the refrigerator for 12-24 hours, the longer you let it sit the more concentrated the flavor will be. Take your french press out of the fridge and strain the coffee through the coffee strainer into your blender. Combine the chilled coffee, cold brew concentrate, coconut cannaoil, coconut milk and boiling water in your blender and blend to your liking. Sweeten coffee with coconut sugar to taste and serve immediately. That's all there is to this vegan cannabis infused coffee recipe. Quick and easy to help make your morning wake and bake sessions that much more enjoyable. If you are looking for more amazing cannabis infusion recipes then you have to read "Cannabis CookBook: Tasty Marijuana Infusion Recipes!" This cookbook features tons of cannabis infusion recipes that you can use for your day to day life, as well as when you want to make some cannabis infused edibles to go with your cannabis infused coffee.